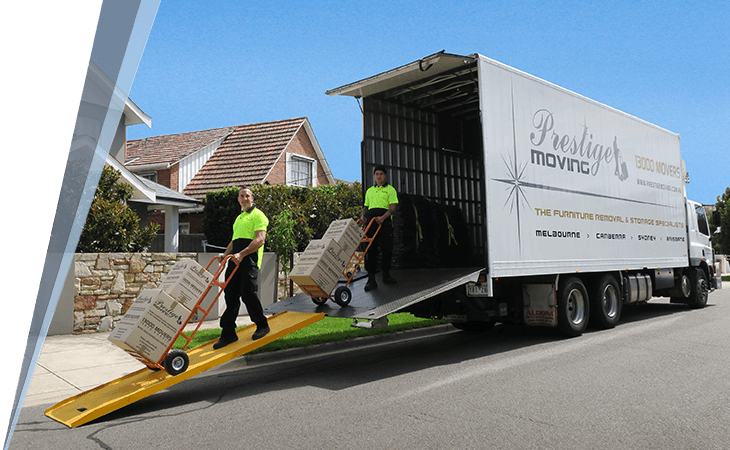 Welcome to Prestige Moving, your Melbourne Removals and Storage Experts. Please fill in the fields below as accurately as possible. We’ll get right back to you with a quote. Are there any access restrictions at the collection property? Are there any access restrictions at the delivery property? Choose the option that best describes the items you're moving. Choose the option that best describes the items you're storing. You selected 'other', please provide further details. Click here for a full storage quote or click here for a full moving quote. 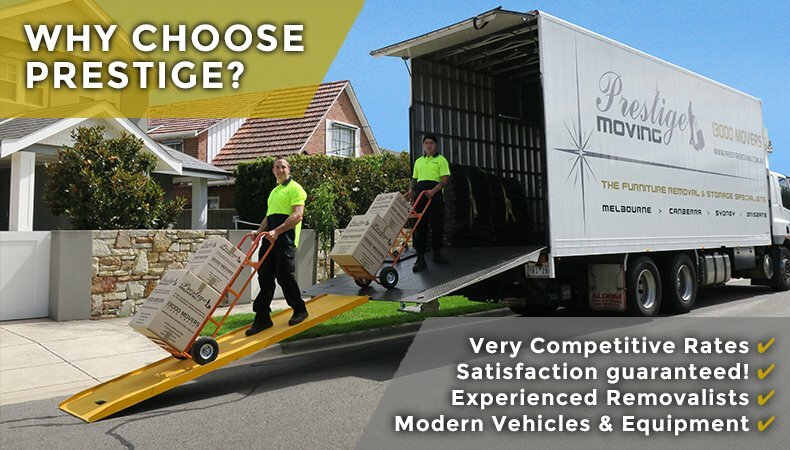 Prestige Moving is a specialist Melbourne removalist and storage company delivering stress free local, interstate and special equipment removal services. Established in 2002, we have a long history of providing exceptional and secure Melbourne moving and interstate moving services. Our trained staff, specialised moving equipment and professional caring approach offer valued assurance that we will protect your valuable assets. Every removalist of the Prestige Moving team takes a focus on providing comprehensive care for our customers, ensuring that all your needs are met during the relocation process. 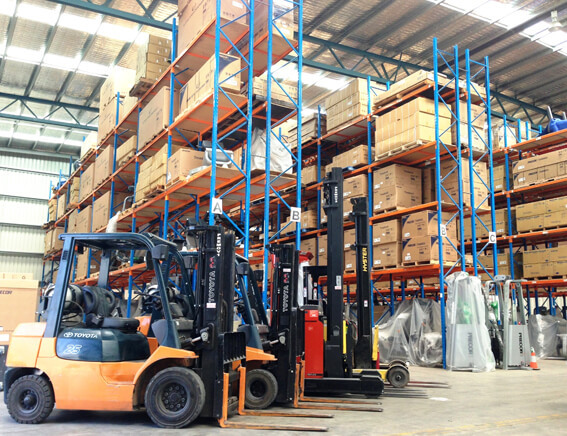 Our commitment to excellence makes us a clear choice for removalist or storage services in the Melbourne area. Talk to one of our friendly representatives today about our range of professional moving and storage services. If you’re moving Melbourne, locally or interstate, you need a reputable Melbourne removalist company that cares about your treasured items as much as you do. Whether you’re moving just around the corner or the other side of town, we will make sure your move is both stress and incident free. As we only charge “Door to Door”, you don’t pay for travel time to and from our depot. 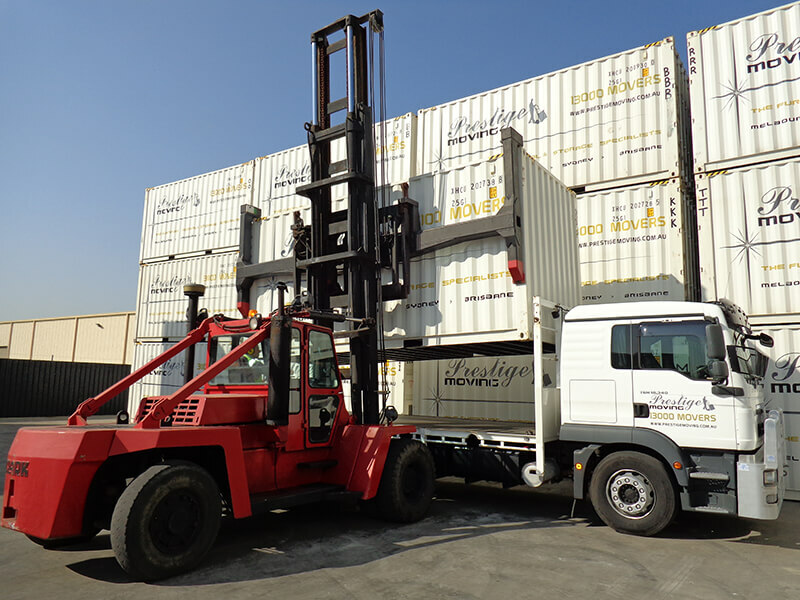 Our competitive hourly rate simply commences upon arrival at your premises and concludes once the delivery is complete. With weekly interstate services running to and from Melbourne we can ensure your items are delivered safely to your new destination. Our trained staff make sure your treasured goods are packed into the vans in the most secure manner to arrive safely at your destination. Let’s face it preparing to move is just as stressful as the actual relocation. At Prestige Moving we offer time strapped customers an efficient packing service and DIYer’s all the packing materials they need. No time to manage your move? Our meticulous packing and unpacking service takes away the hassle and the stress. We will make sure your goods are secure and well protected during travel, and when they have safely arrived at your destination, we can also unpack and store your items at your new address. Packing for the move yourself? We’ve got all the boxes, bubble wrap, protective covers and bits ‘n bobs you’ll need to secure pack your own goods. Some goods are just too delicate, too important or too hefty to move yourself or trust to just anyone. Whether it’s a grand piano, a 1000kg marble statue or a 6ft tall bank safe we have the experience and the capacity to relocate items with the utmost care and integrity. 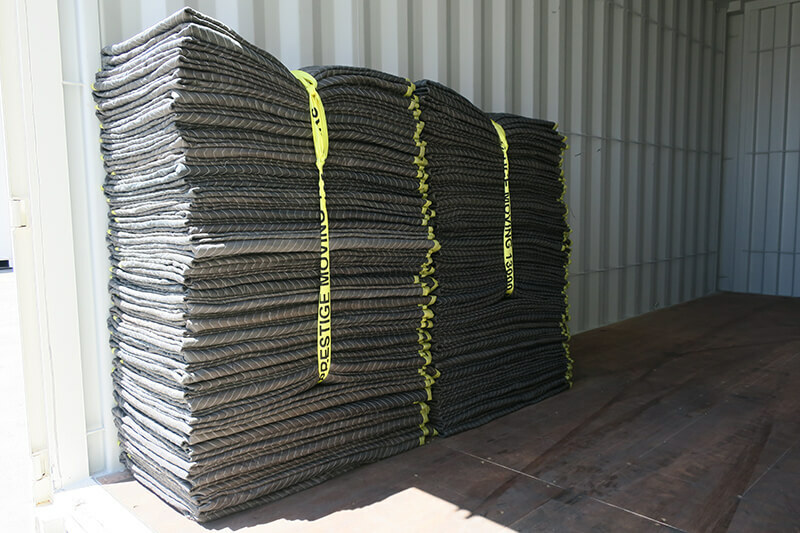 Our trained staff and custom-made trucks are strong enough to safely relocate both commercial and home gym equipment, weights and plates, fixtures and racking and more. Stay ahead of the 8 ball. We can safely relocate billiard tables, snooker tables and pool tables of all sizes. temporarily store your goods and treasures? 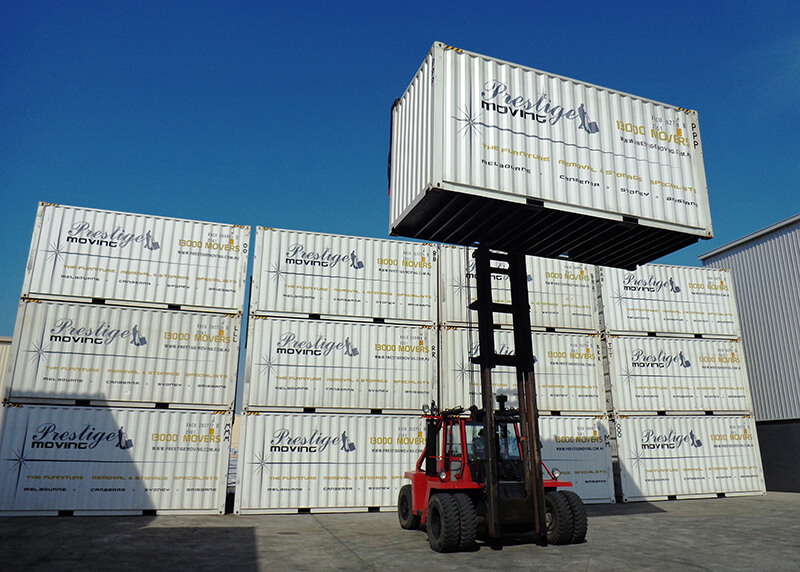 We have a range of Melbourne storage and container hire options for both onsite and offsite needs. We are an Australian owned, Melbourne removals business established in 2002. 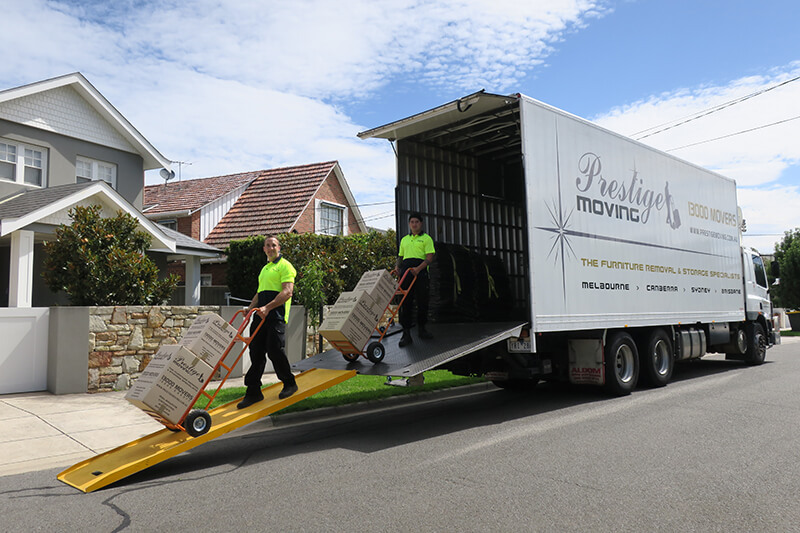 Over the years we have successfully completed more than 25,000 moves across Melbourne and in Australia. Not only are our staff professional and friendly, but also well trained in “the art of relocations” to deliver a quality service. They also care. Prestige Moving may be our name but our prices are anything but. We offer competitive prices that suit all budgets and a service that is good value for money. Prestige Moving is a proud member of the Australian Furniture Removers Association. It shows that we take our business, our industry and our level of service seriously. We are so passionate about the quality of service we offer we are continually looking at ways to improve. We custom make our trucks, trailers, felt furniture covers, tie downs and trolleys to make them even stronger, easier to use and efficient. Thanks a lot for following up on the concerns I raised. I am very impressed with your service and it has left me with a positive impression of my dealings with Prestige Moving. I will definitely be recommending you to my family, friends and colleagues. Careful, efficient and professional…everything that you’d want in a reliable removalist! I highly recommend Prestige Moving and its superb staff. A huge shout out to you guys! We have just relocated with Prestige Moving for the first time. Our move from Melbourne to Brisbane was fast, comfortable and efficient. 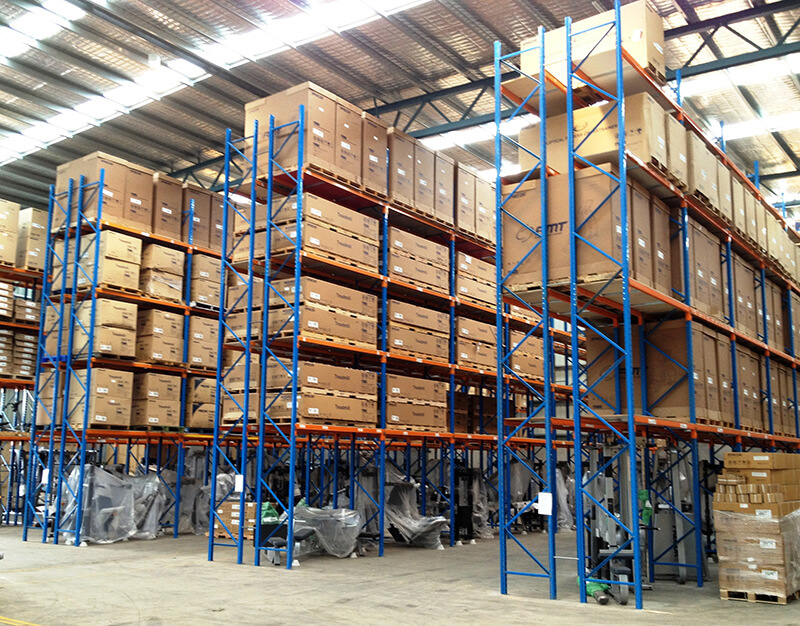 The team in Melbourne packed our items with great care, while the team in Brisbane delivered everything right on schedule. It couldn’t be any easier…we definitely recommend Prestige Moving! We were very pleased with the service provided by Prestige Moving. From the first point of contact, the members of the team were courteous, friendly and easy to deal with. In spite of the hassle of street parking, they stayed calm and professional right through to the end. Thanks a lot! Terrific job done by the team of Prestige Moving! I will absolutely recommend your services to anyone looking for a fast, smooth and stress-free relocation! The guys from Prestige Moving worked hard and nearly non-stop all day! We were very pleased and happy. Thanks very much again! Our experience with Prestige Moving was awesome from the first phone call. The removalists that arrived on the day took great care of all our stuff, no breakages and no damage whatsoever. I won’t hesitate to recommend Prestige and would certainly use them again. Fast and professional service! My friend recommended Prestige Moving as our lease had ended. The rate was reasonable and we couldn’t be happier with the quality of service. I already recommended you to my uncle! I’ve had a very positive experience from start to finish. The members of the crew were on time, polite, reliable and efficient. Not a single breakage! I am very pleased. Thanks for delivering my valuables safely and in a timely manner. We couldn’t be happier with Prestige. No one enjoys moving, but they made it as easy as possible with their friendly and professional attitude. The rate is very competitive and I could tell that they had years of experience. I’d certainly recommend Prestige Moving to anyone! From the first phone call to watching the truck drive away, the service we received from Prestige Moving was faultless. The initial volume estimate was spot on; the packers were fast and the guys who loaded my boxes were friendly, punctual and professional. We couldn’t thank everyone enough, they left nothing for us to stress about! Excellent service by Prestige Moving – from the initial phone call to the final delivery of all our stuff – absolutely 10/10! A very skilled, experienced and professional work force. The removalists were friendly, professional, and executed the move in a very efficient manner. I really appreciate their attention to detail in dealing with fragile items and preventing damage. A great experience overall and would not hesitate to recommend Prestige Moving. Superb job completed in record time! We absolutely recommend Prestige Moving. Excellent service and very professional indeed. They really know how relocation should be done. Thanks a lot! From packing in Melbourne to storage and delivery to our new home in Brisbane, the service was exceptional to say the least. We highly recommend Terry and his staff at Prestige Moving. Fast and efficient service as always, thank you so much! The guys from Prestige Moving were awesome in every way! Nothing was too much trouble for them. The price was competitive too, compared to three other known players in the removal industry. Certainly a 5-star service! Thank you! Our best move thus far! We just wanted to say thank you to Terry and his team for moving us for the second time in two years. We are truly pleased and grateful for your hard work. For now, we are settling but if we’ll need to move again we definitely know who to call! We relocated a 2-bedroom house from Melbourne to Sydney. The entire process from initial contact to the delivery was flawless. The packing and removal team took good care of all our stuff. We certainly recommend Prestige Moving and won’t hesitate to use their services again if needed. I’m not sure of the formal way to do this but I just want to say that the guys from Prestige Moving did a wonderful job. The packers and movers were fast, careful and professional. All our belongings arrived in pristine condition, on time and all for a very competitive price. Thank you for making an interstate move easy for our family. Engaging the services of Prestige Moving was absolutely amazing! We literally booked a couple of days before we needed to relocate and this was no issue at all. Everyone we dealt with was friendly and very reliable. This really made our moving experience a positive and pleasant one. The guys from Prestige Moving were fantastic. We had some hold ups on moving day but they were very professional and accommodating. They had everything done in super fast time! Highly recommended to those looking for a speedy, reliable and reasonably priced service. Incredibly efficient service and I felt like a valued client. The team showed up on time and accomplished everything as scheduled. No hassle whatsoever, just a wonderful experience for my entire family. Wouldn’t use anyone else! A huge shout out to Terry and everyone at Prestige Moving! Just wanted to thank you for the superb service you provided. Both removalists were careful, friendly, professional, and completed the job fast. We could barely keep up! We were totally impressed with the whole process which made our interstate move easy, simple and less stressful. Very professional and efficient! Well priced and even provided additional services. Excellent customer service, highly recommend! Forget the rest, Prestige Moving is the best. Excellent service yet again! It was my second move with Prestige and the entire process worked very well from start to finish. Thanks a lot! Have moved recently and used a competitor. Prestige Moving is hands down the best service provider. The team in Melbourne was really great and efficient. Had a problem with a lost aircon remote that was solved immediately and delivered to my office the following day. Simply the best, thanks Terry and team! Moved locally in Toorak and also had several items in storage for few months delivered on time. Team was great, nothing was too much trouble, and when all of our stuff were delivered and unpacked, my family was left in good shape to get on with enjoying our new home. Thanks! I highly recommend Prestige Moving to anyone moving interstate. The team was fast and reliable, and more importantly their service before, during and after the move was exceptional. I am so impressed with them. Excellent company to use! Thank you so much Terry! I’d like to take this opportunity to commend the professional manner with which your team conducted themselves while packing and loading my belongings. I was really impressed by the work ethic that they showed. Because of the experience I’ve had with your team I’ll definitely be recommending Prestige to other potential customers. The team was fantastic to say the least. Courteous, professional and explained everything in detail. Took good care of my personal effects and worked fast. Thank you so much, I couldn’t be more satisfied with how things played out! My previous experience with Prestige Moving was awesome. This time was no different. The team was fast and efficient, again. What more can I say? You’re the best! From the first phone call to watching the truck drive away, the service provided by everyone I dealt with at Prestige Moving was outstanding. The quote was spot on; the packers were incredibly fast and the guys who loaded the container were friendly and polite. I just couldn’t praise and thank everyone enough! 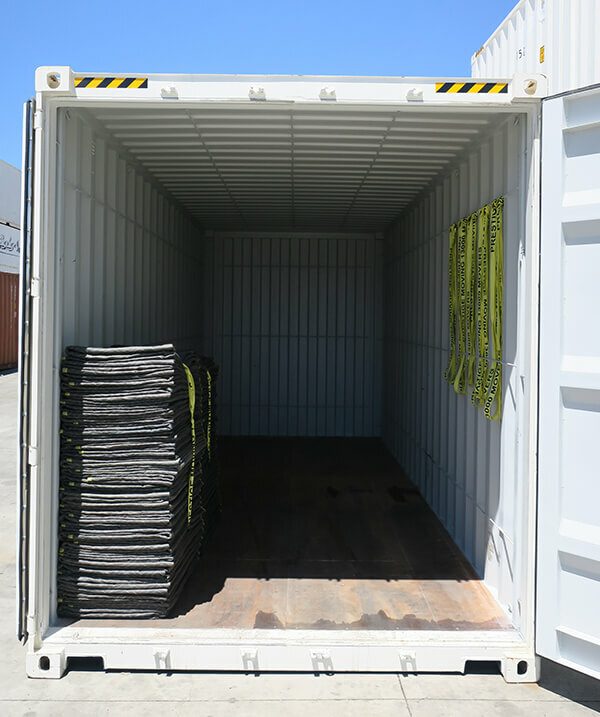 I’d like to grab this opportunity to commend the professional manner with which your team conducted themselves during the packing and loading of my stuff. They packed all items with great care and I was truly impressed with the work ethic that they showed. Because of the experience I have had with your staff I will certainly be recommending them to other prospective clients. Thank you so much! 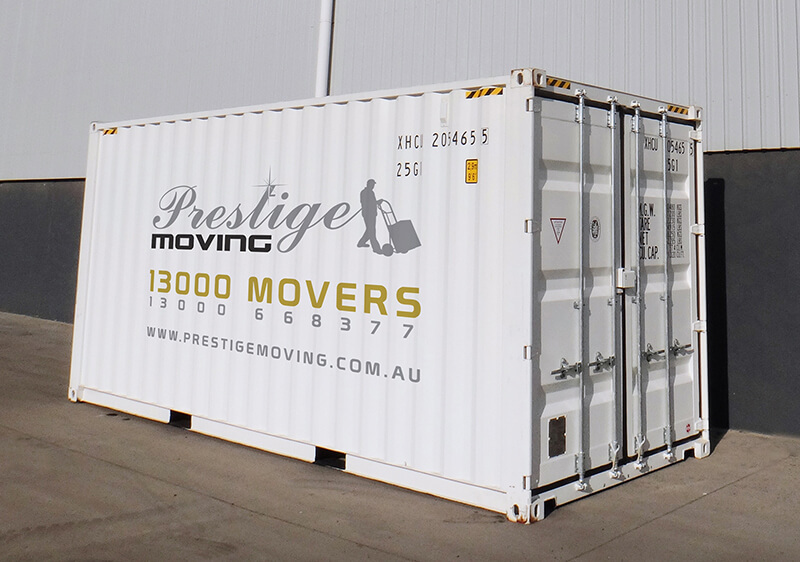 I recently organised a complete office move in Melbourne with Prestige Moving. The guys arrived on time and they were extremely friendly, super fast, and very professional. For sure, I will highly recommend Prestige to anyone requiring this type of service in the Melbourne area. Big thanks to everyone involved for a smooth and hassle-free relocation! Absolutely superb service, outstanding and exemplary. The entire team was a pleasure to deal with and they tried their best to understand all my needs for my move from Melbourne to Sydney. Packing service was fantastic. All personnel were extremely friendly and helpful. I will only ever use Prestige Moving. because it’s simply the best and I’ll bet other removal companies out there could learn a lot from these guys. No doubt they are a leading industry company, great customer service, knowledgeable and well-trained staff. I couldn’t be happier. I just want to drop you guys a line that I think highly of Prestige Moving’s service for our move in Brighton last week. Your guys were extremely friendly, efficient and professional. If ever I’ll have the chance to recommend a removalist to friends and family, I’ll mention your company straight away! I just want to thank your company for an efficient move for my elderly parents and all their antique furniture from Mont Albert to Tullamarine. There wasn’t any trouble, great friendly and professional movers. I will surely be recommending your services and will contact you again if I am in need of expert removalists. Great job! I can’t recommend these guys highly enough. Talk about professionals with a human face. What I initially thought was going to be a very stressful move and storage for my excess stuff turned out to be quite simple and easy. Not only did Prestige Moving take care of my personal effects as if they were their own, they helped me organize all items in my new home. Don’t go past this exceptional team without talking to them. Their services are absolutely worth their weight in gold! In my move closer to my kids, I’m so pleased with the way the staff of Prestige Moving gave me a free quote, packed, loaded and delivered my household of valuable items I’ve collected in my life. Some were so delicate and fragile. Your team made the move to my new home hassle-free with all items exactly the same as they left my old house. Very thankful to you all. Cheers! I just wanted to say thanks a lot for everything that was done to make our move to Brisbane as smooth as possible. At the start of the move I considered the things that could go wrong and I expected some hiccups along the way. We have already unpacked all the boxes and I can say that the entire journey went extremely well and I’m truly impressed with how the guys from Prestige Moving worked together to make sure that our goods all arrived safely in Brisbane. Well done, we are so pleased with the service you provided along the way. Warmest regards to the team from Prestige Moving.! I wanted to get in touch a lot sooner but had been flat out with my two-month old baby. It was the third time I used your company, the first one being three years ago. The last move gave me a lot of headaches because of the hassle of searching for a new flat. Probably the toughest part was the removal, but you guys have been really outstanding and did a wonderful job. Please pass on my sincerest gratitude to everyone! More power to your company! Just wanted to take a few minutes to thank you and your team for an awesome job packing and moving last week. Please pass on my heartfelt gratitude to the guys. The packers were very careful with our belongings. This is our second move with Prestige and we won’t consider using anyone else. You have a very friendly and helpful crew and they genuinely care about our possessions. Prestige Moving provided a superb service with a smile. Their team came on time and was very professional. I’ve used four removal companies over the years and have had the best service from Prestige. They’ve got the nicest and most efficient crew. Thank you!”Prestige Moving provided a superb service with a smile. Their team came on time and was very professional. I’ve used four removal companies over the years and have had the best service from Prestige. They’ve got the nicest and most efficient crew. Thank you! My artworks and gallery pieces arrived safely, along with all of my other life collected items. China, glassware, books, etc. I’m very happy with Prestige Moving’s people who made my relocation closer to my kids, not completely painless, but really close enough. The service before, during transit and delivery was simply superb. All being accommodating and friendly. Thanks a lot, I am delighted! I have heard horror stories from friends / colleagues about other removalist companies. I will refer this company to anyone. Excellent Service from beginning to end. Shaun and Ronnie were very professional and responsive for all my requests. 10/10! I will also do a Google review for you! Ronnie + Mark put me at ease with what is a stressful move for us. They were helpful – polite & just lovely gentlemen. Thanking you both abundantly. Thank you for all for all your help with helping us move house. Everything went really well and your movers were great people. Your movers were really quick, helpful and all around amazing people to deal with. Being a return customer I was happy that I got the same level of excellent service as I did the first time. We move a lot as defence members & you guys have been the best yet. Friendly, professional & careful with our belongings. 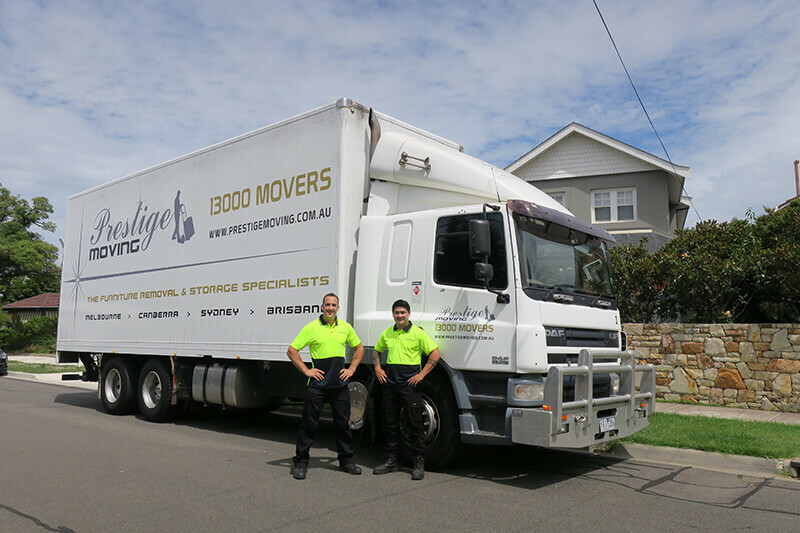 Thank you Prestige for being so accommodating in our emergency, and a massive thank you to the young men Jerry, Luke and Ben who organised our move so efficiently. Ben + Anthony – Awesome Dudes! Cheerful, helpful – could not have managed without their friendly help + expertise – above and beyond with advice + all services – Master of all trades! Need to be acknowledged for excellence in service. The 2 removalists were very helpful + double checked with us to ensure that the right items were going to the right addresses. Very careful handling was a pleasure to see. Excellent Service. Very well mannered, excellent communication. Made packing a pleasure! Jim and Nick are awesome! Luke + Jnr were awesome. Everything unpacked + stored without any fuss. Great job!! This is my 3rd time using Prestige and I am very happy with the service. Nick, Mark & Jim are fantastic ! Fantastic service & communication more than helpful on all levels. Good working team. Would highly recommend this team. Thank you so much. Mark & Ryan were fantastic. Very helpful & Pleasant. Would highly recommend. Did a great job! Amazing young men you have employed. I would employ them in my business. They are so great, professional, friendly always happy – They deserve to be on $50 per hour. Ring me any time for references. I’m the 3rd in a group of friends in months to use your company. Will refer Prestige on-going. Great bunch of guys more than happy to help with any requests. Went above & beyond. Definitely would recommend. Ben & Anthony – Awesome Dudes! Cheerful, helpful – could not have managed without their friendly help & expertise – above and beyond with advice + all services – Master of all trades! They need to be acknowledged for their excellence in service. The two removalists were very helpful & double checked with us to ensure that the right items were going to the right addresses. Very careful handling was a pleasure to see. Luke & Jnr were awesome. Everything unpacked & stored without any fuss. Great job!! We contacted Prestige with an emergency request and within 2 hours of the call for help, an appropriately large truck arrived. Within minutes of their arrival, the team Jerry, Luke and Ben had put us at ease. They worked incredibly well as a team and everything they did was done with our best interests in mind. Our moving day was cold, wet and windy – and on arrival at our new home in Ballarat it was also dark! They worked to unpack the van under extreme conditions, without a single complaint or grumble. We can’t give them enough praise. Excellent company. They take care of absolutely everything: wrapping, packing, moving and unpacking. I was very impressed by their professional attitude, and willingness to go the extra mile. Hello. I just wanted to express my gratitude to Prestige Moving for doing such a wonderful job for myself and my family. It had been a very stressful time for us, and Adrian and Tim made the whole thing just so much easier. My wife was very concerned about moving her statues, but they arrived intact, no problems. Thank you very much. I will recommend you. Thanks to the staff at Prestige Moving for an excellent experience. They were professional, on time, and just all round good at their jobs. No hassles at all, I would highly recommend them. Just thought I would send you a quick email to say thank you for looking after my move from Melbourne to Sydney, I was very stressed about it and you guys just took care of everything. I was very impressed with your Companies customer service i.e. phone calls and emails etc. and it was good to deal with one person that I could call whenever I needed to and nothing was a problem. Please also thank your driver Daryl for me, he was very careful with my goods and everything arrived in good order. Thank you for moving our household goods from Albert Park to Caulfied. As a married couple in our seventies, we were not looking forward to moving house. We had to move into a smaller place because Jacks movement is not as it once was with the arthritis etc. We were sad to leave our home of twenty two years, however, your staff made it a bit better for us. They were very efficient and friendly chaps. They even waited for us to take a last walk through before we left. I wanted to write to you to express my gratitude, I will certainly recommend your services. Just thought I would let you know your guys Chris and James were fantastic the other day they worked really hard. It was a very hot day and they just kept on going without a fuss, they were very courteous & friendly. In general from start to finish it was a very good experience and I wouldn’t hesitate to recommend your Company to everyone I know. Please make sure you personally thank your guys for me. Just a quick email to let you know how happy I was with the service provided by your company, Prestige Moving. I moved from Toorak to Docklands and although the access at Docklands was rather difficult, your crew were absolutely fantastic and extremely accommodating. 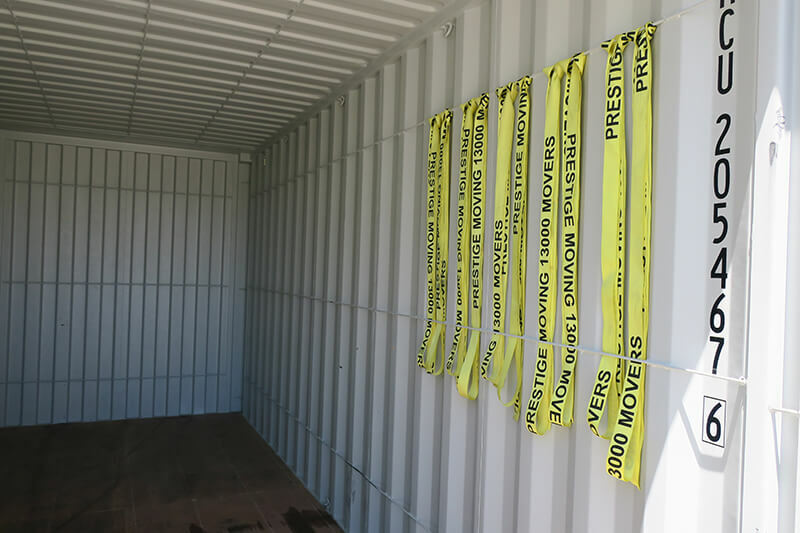 Your professional packers and movers certainly made this relocation easier for me and my goods were packed, wrapped and transported with the utmost care. I couldn’t commend their efforts enough and I will definitely be recommending your service to everyone! A huge thank you to your staff Wes & Nick for making my move a breeze last Thursday & Friday, they were very careful with my furniture wrapping every item in blankets and the packing service was fantastic. Everything arrived in perfect condition, they even put everything back in the kitchen cupboards the way it was at the old house! I will definitely recommend Prestige to my friends and family. The Prestige guys arrived at our place in Kew dead on 8am as per the appointment. They followed me around the house for a quick review and then got straight into it. They pretty much ran all day until the moment they finished (and headed off to another job in the city!). In the end, they fully loaded and turned around two 8 tonne truck’s. Nothing was damaged. Nothing was too much trouble. The guys were friendly and stuck to their task all day, I couldn’t have asked for more. Super impressed. After the disaster of our previous move carried out by a shonky operator, Prestige were such a relief and a breath of fresh air. We don’t plan on moving again anytime soon, but when we do, we know who to call! Please thank your employees Stan & Daniel for doing such an excellent job last Thursday, it was a really hot day and the guys had two flights of stairs to walk up and they just got the job done without a fuss. I will definitely recommend your Company to family & friends. Just wanted to send a note of thanks for the service provided by the Prestige guys. Both in Sydney and Melbourne the guys were fantastic – could not have asked for a better job. I would like to say a huge thank you to Wes and Jim who moved all my furniture last Friday. Me and my family have moved many times over the years and I have never had two of the nicest, most professional guys take such care with my belongings. As soon as they walked into the property I could tell that they knew exactly what they were doing, and with it been an old style home with narrow doors etc, they made it look easy. And to top it all off they were both such lovely great guys. So thank you Wes and Jim so much and I will certainly recommend you again. Looking for a Proven Furniture Movers in Melbourne? completed more than 25,000 relocations across the city of Melbourne and in Australia. Association. Which means we care about our reputation, level of service and customers. Let’s move you to your new destination.